The hundreds of hours I spent photographing and analysing Whitbread’s brewing records have been well worth it. Because I have their beers for every year from 1805 to 1973, when Chiswell Street closed. Remember that photo I posted recently showing Best Ale being racked into casks? I was able to work from the gyle number that was stencilled onto the casks (348) that the beer was brewed around 19th May. I don’t have a photo of that particular brewing record, but I do have one from 9th June, gyle number 391. That’s close enough for me. Other than that, there isn’t anything particularly special about this beer. And it’s certainly nowhere near what I’d describe as “best”. It’s a totally run of the mill post- WW II Mild*. With a gravity around 1030º, and a simple grist of mild malt, crystal malt and No. 3 invert. Though in the original some of the sugar was Hay M. Pretty sure that’s a dark proprietary sugar, so I’ve just upped the No. 3. It’s also a very typical London Mild, in that it’s quite dark and poorly attenuated. London Milds after WW II developed their own identity. At least until they started to die off in the 1960’s. By the late 1970’s, I believe Fullers Hock was the last cask Mild regularly brewed in London. That’s it. I only really wanted to let you know what the beer they were filling in that picture was like. 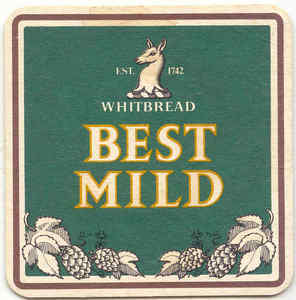 * Come to think of it, as Whitbread only brewed one Mild they couldn't even call it Better Ale, let alone Best Ale. The fact that you can more or less tell us what beer was being racked and the actual day it was in some random photo, shows us how just far you have come, Ron. The historian in me is well impressed while the beer lover is just left gasping in awe. Do you what they had for lunch??? Joking! Great job, Ron, keep them coming.